The track quickly gets in to its strong chorus with the hook line “baby I’ll be on the road…”, with an uplifting, catchy melody which has unsurprisingly led it to being featured on playlists across national radio. The whole track implies a life of a touring band filling their time with the important stuff: beach, sun, surf, whisky, girls and everything else that a young man with sense should shoot for. This is another honest song that optimises the surfing life style – and as an ex-surfer it brings with it a nostalgia that takes me back to the summers spent on the beach chasing girls and learning to be young and free. ‘On The Road’ comes from a bunch of musicians who are living it, without the pressure of a busy city lifestyle – words from the frontman Rory: “We couldn’t write the songs we do living in, say, London”. Their home-town Hossegor is often referred to as the European surf capital down in the South West of France. Rory’s voice is very distinctive, it will likely remind you of an early Kings Of Leon from the days of ‘King of the Rodeo’ and ‘The Bucket’, with its own husky edge. I’ve often thought that the music world is missing this kind of band. Too often groups who have this bohemian spirit are told to go down the floppy hair, indie kid scene route – Sunset Sons could never be that band. Following on from their hugely successful debut tour of the UK, the band have just announced a return to the UK and Ireland for 2016, including a headline show at London’s KOKO. I will be there…if you’re not, then clearly you haven’t heard them yet. Sunset Sons, ladies and gentlemen… what a band. 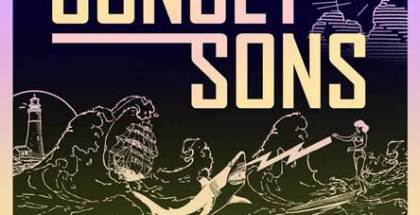 UK and Australian band Sunset Sons have come up with yet another brilliant single - 'On The Road' - taken from their highly anticipated debut album Very Rarely Say Die, set for release later in 2016.